웹서버로 직접 접속하여 확인하고자 한다면 방화벽을 열어줘야만 한다. 이제 각 인스턴스의 “External IP”로 웹서버에 접속할 수 있다. Apache plugin 중에 mod_status 가 설치되어 있는지 확인한다. GCP 에서는 status.conf 가 기본으로 설치되므로 잘 된다. server-status 가 없어서 404 Not Found 가 나온다. server-status 를 설치해주자. $ sudo su -c "echo 'LoadModule status_module modules/mod_status.so' > /etc/httpd/conf.modules.d/00-status.conf"
각 서버를 클릭해보자. 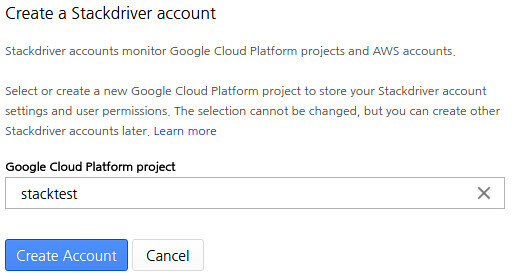 stackdriver agent가 plugin이 정상으로 동작하여 정보를 제대로 가져온다면 Monitoring의 오른쪽 그래프 윗부분에서 다음과 같은 화면을 볼 수 있다. 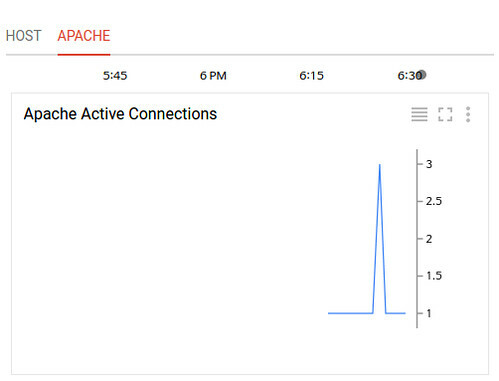 Active Connections (count): The number of active connections currently attached to Apache. Idle Workers (count): The number of idle workers currently attached to Apache. Requests (count/s): The number of requests per second serviced by Apache. $ sudo sh -c "echo 'deb http://www.apache.org/dist/cassandra/debian 37x main' > /etc/apt/sources.list.d/cassandra.list"
$ sudo sh -c "echo 'deb-src http://www.apache.org/dist/cassandra/debian 37x main' >> /etc/apt/sources.list.d/cassandra.list"
cassandra 3.x Repository 를 추가해준다. Cassandra 는 JMX 를 통해서 모니터링을 하기에, Cassandra에 JMX 설정이 되어야만 하는데, 다행히 localhost 호스트에서의 JMX 설정은 되어 있는 상태이며 기본 포트는 7199이므로 다음 명령어로 확인할 수 있다. 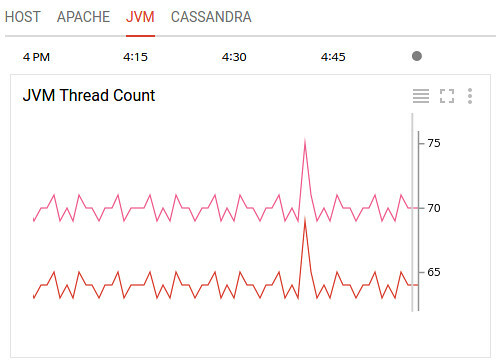 Cassandra는 JVM 기반으로 동작하기에 친절한 Stackdriver는 JVM 모니터링까지 함께 할 수 있게 자료를 수집해서 보여준다. 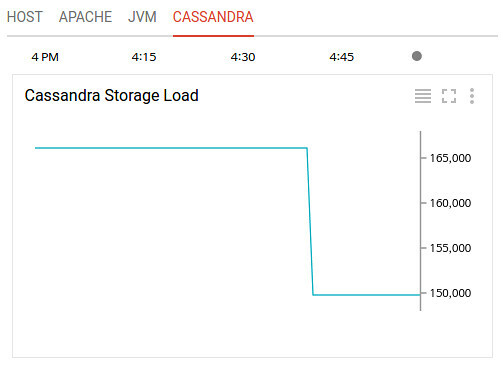 Storage Load: The amount of data stored on each Cassandra node. Pending Tasks: The number of basic task stages waiting to run. Active Tasks: The number of basic task stages currently running. 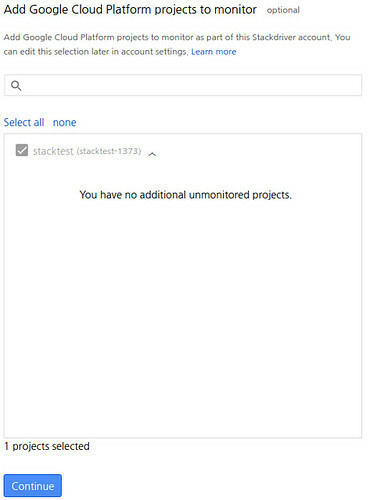 Blocked Tasks: The number of basic task stages blocked from running. Pending Internal Tasks: The number of internal task stages waiting to run. Active Internal Tasks: The number of internal task stages currently running. 모니터링을 위해 clusterMonitor Role를 가진 유저를 admin database에 생성해준다. 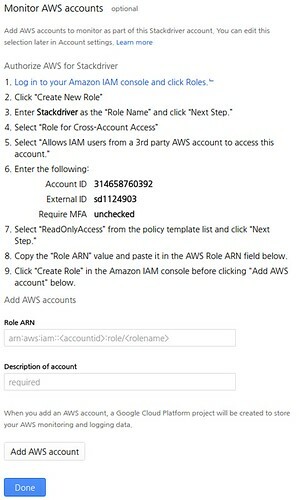 db.auth 명령어에서 “1”이 나오면 정상으로 인증에 성공한 것이다. mongodb.conf 파일을 열어 STATS_USER, STATS_PASS 의 주석처리(“#”)을 지워주고, 앞에서 생성한 유저의 ID와 Password로 바꿔준다. Current Connections (count): The number of active connections to MongoDB. Global Lock Hold Time (ms): How long the global lock has been held. Mapped Memory (bytes): The amount of mapped memory used by MongoDB. This is roughly equivalent to the total size of your database, due to the use of memory mapped files. Virtual Memory (bytes): The amount of virtual memory used by MongoDB. If the virtual memory size is significantly larger than mapped memory size (e.g. 3 or more times), this may indicate a memory leak. Resident Memory (bytes): The amount of resident memory that is used by MongoDB. This is the amount of RAM being physically used by the database. Operations [command, delete, getmore, insert, query, update] (count/s): The number of [command, delete, getmore, insert, query, update] operations executed per second. Database [Collection, Index, Object, Extents] Count (count): The number of [collections, indices, objects, extents] currently in the database. Database Data Size (bytes): The size of the data currently in the database. Database Storage Size (bytes): The size of the storage currently allocated to the database. Database Index Size (bytes): The size of the index for the database. 모니터링을 위해 DB 사용자를 추가해줘야 한다. ID와 Password는 반드시 수정해서 입력하길 바란다. 다은 받은 파일을 열어서 “STATS_USER”, “STATS_PASS” 를 모니터링을 위해 추가한 DB 사용자 정보로 바꿔준다. Connections (count): The number of active connections to MySQL. Select Queries (count): The number of select queries being run. Insert Queries (count): The number of insert queries being run. Update Queries (count): The number of update queries being run. Active Connections (count): The number of active connections currently attached to Nginx. Reading Connections (count): The number of reading connections currently attached to Nginx. Writing Connections (count): The number of writing connections currently attached to Nginx. Waiting Connections (count): The number of waiting connections currently attached to Nginx. Requests (count/s): The number of requests per second Nginx is servicing. 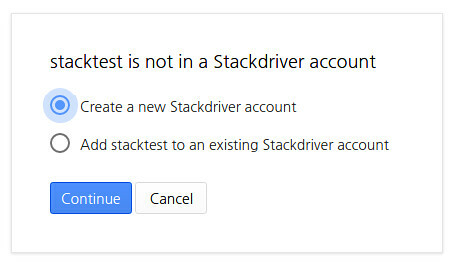 pg_hba.conf 파일에 앞에 생성한 stackdriver 유저로 접근할 수 있도록 접근 권한을 줘야 한다. 다음 내용을 추가해준다. postgresql 서버를 재기동 한 후, 잘 접속 되는지 확인해본다. postgresql.conf 파일을 열어서 다음 내용으로 수정해준다. #Host "localhost" ==> Host "localhost"
Connections (count): Number of connections to PostgreSQL. Disk Usage (byte): Number of bytes currently being used on disk. Commits (count/s): Number of commits per second. Rollbacks (count/s): Number of rollbacks per second. Heap Blocks Read Rate (count/s): Number of blocks read from the heap. Heap Cache Hit Rate (count/s): Number of blocks read directly out of the cache. Index Blocks Read Rate (count/s): Number of blocks read from the index. Index Cache Hit Rate (count/s): Number of index blocks read directly out of the cache. Toast Blocks Read Rate (count/s): Number of reads from the toast blocks. Toast Cache Hit Rate (count/s): Number of toast blocks read directly out of the cache. Toast Index Blocks Read Rate (count/s): Number of blocks read from the toast index. Toast Index Cache Hit Rate (count/s): Number of toast index blocks read directly out of the cache. Operations [delete, insert, update, heap only update] (count/s): Number of rows [deleted, inserted, updated, heap only updated] in the db. Dead Tuples (count): Number of tuples that are dead in the db. Live Tuples (count): Number of tuples that are live in the db. Client Connections (count): Number of clients connected to Redis. Slave Connections (count): Number of Redis slave connections to the master. Memory Usage (bytes): Amount of physical memory being used. JMX 모니터링을 사용하기 위해 catalina-jmx-remote.jar 파일을 설치해줘야 하는데, Debian 8 은 tomcat7을 설치하면 함께 설치가 되나 CentOS 7 은 직접 설치해줘야 한다. 다음 내용으로 /usr/share/tomcat7/bin/setenv.sh 파일을 만든다. /etc/tomcat7/server.xml 파일을 열고 Server 항목에 다음 Listener를 추가한다.